At the age of 10, Steven Jamison was a whiz at making cheesecakes; a few years later he was selling them. By 2007, he realized his profession and his passion - cooking - was killing him . After three months of fad diets, he reformed his life and eating styles. Today the former Floridian, executive chef at the Sheraton Atlanta Hotel, prepares health-conscious, locally sourced "Southern Evolution" fare. An internship at Disney's EPCOT added worldwide influences and the result is in the menus for the hotel's two restaurants, banquets and conventions. Here's a recipe Chef Jamison shared with us. In a mixing bowl marinate the chicken breast for one hour with adobo sauce and one minced chipotle pepper, 2 cloves garlic, juice of half a lime, salt and pepper. On a low grill cook chicken to a internal temperature of 1650 F, brushing with the marinade half way through cooking. Allow the chicken to rest five minutes before cutting. Dice into small cubes and hold warm until served. Coat four roma tomatoes, two cloves garlic and half a red onion with olive oil, salt and pepper. Place on a sheet pan and roast in a 500 F oven until the tomatoes begin to char. Add blanched corn and store in a bowl until ready to serve. In a sauce pot slowly simmer one can black beans, one can chicken stock, two diced roma tomatoes and one quarter red onion diced. When the liquid has reduced till almost dry remove from the heat and put aside. Dice the avocado into a bowl and mix with the juice of half a lime, one quarter red onion finely diced and the rest of the cilantro and scallions. Store in bowl with the avocado seed. Wash and remove eight outer leaves from the butter lettuce. 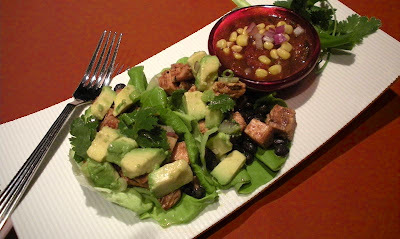 In each leaf put 2 ounces of black beans, 2 ounces grilled chicken, one tablespoon of avocado mixture and one tablespoon salsa.